Attract, recruit, and retain A+ talent. Explain what gets an employee hired, promoted, or fired. Communicate the culture, mission, vision, values, and expected behaviors of the company. Illuminate how employees can make a difference and fulfil their potential. Answer the fundamental questions that potential employees may have about how the business operates. I have interviewed and spoken with hundreds of founders and CEOs about their culture and one of the areas I explored during these interviews was how they had gone about creating their company's culture decks. There are two main reasons why culture decks are hard to do: firstly, there are lots of culture decks available online but no overarching document that explains what an effective culture deck is, and what it should cover; and second, that very few people have the time to research all the different decks to learn how others have structured and written theirs. I have written Culture Decks Decoded to solve both these problems. If the Netflix culture deck is the most important document to come out of Silicon Valley, this must be the most important document to come out of Silicon Roundabout. Every high-growth startup Founder should read this book. Using his 17 years of experience working with high-growth companies, Brett has put together a playbook for Founders to build great company cultures, and consequently great companies, from day one. Brett is operating at the cutting edge of company culture. He is leading the way in understanding how high-growth companies leverage their culture and build exceptional businesses. I highly recommend this book! I found it to be truly fascinating. Every slide that Brett has chosen gives so much insight into the way the company thinks about their culture—and how he has incorporated his thoughts and comments to guide the reader through the book. Great book and definitely on top of the pile of books I have read during the past twelve months. A culture deck/code/manual/manifesto (call it what you want) is table stakes when it comes to winning the war for talent. This handbook is your royal flush. I really like the concept of this book, it's filled with lots of valuable insights. Having come from a company that screamed culture (for nearly 2 decades), I can fully understand why, how, where, when it's important. And, it’s a great reminder for me to continue to work with my team to define our culture. It's made me even more aware how important a strong culture is during the recruiting and hiring process, when giving feedback on performance and behaviour, as well as the dreaded exercise of firing. Culture is critical to the success of high growth startups. Culture Decks Decoded provides a comprehensive evaluation of some of the world’s most successful company cultures, and a playbook for startup founders and aspiring entrepreneurs on this critical subject. An essential read on how to create an excellent culture deck for your business. The fact that 1 in 10 founders hasn’t done anything about their company culture doesn't surprise me, as I've never had a conversation with another founder about a culture deck, but having read this it makes me wonder why and has prompted me to get to work on my own. When should a startup start working actively on defining its culture? Since I co-founded Reedsy in 2014, this question has always puzzled me: how can I define the culture of a company when it's just me and my co-founders? When is your culture starting to appear and then what should you do so it evolves positively? How do I make sure it's not all fake? Culture Decks Decoded is a great read for entrepreneurs who are not just looking at their top line revenue but also at the environment they're creating for their employees and the values they want to share with customers. PETER WARD, CO-FOUNDER OF WAYN, AND HUMANITY INC.
At last! Someone has created a framework to help founders create a culture deck. This book is brilliant in its simplicity. Culture becomes a defining feature of a company whether it’s done intentionally or not. Success or failure can often be traced back to cultural values. It’s such an important part of the businesses I have worked in or built that I wish I had read this years ago. With the global digital revolution, never has placing emphasis on your company culture as a definable asset been more important than it is today. Using this handbook to help create your culture deck will save you hours of time and ensure that it really resonates with your target audience. I’ve been lucky enough to work with over a 1000 of the UK’s most successful entrepreneurs. What they all share is an uncanny ability to attract and retain the very best talent. And they do that by obsessing over culture, vision, mission and values. Brett has written a brilliant blueprint on how to communicate and leverage yours by assimilating the best of the best culture decks in one place. Buy this book and ensure you build the culture, team and the success you deserve! Reading the content of these slides is a real eye opener. You get an immediate sense of each company’s culture. This book is required reading for every founder, CEO, Head of Talent/HR/People. Progress comes from standing on the shoulders of giants. Brett supplies the ladder with this excellent book. This book is a godsend to anyone who has spent any time trying to write their own culture deck. After 38 years of Executive Search for Venture Capital funded startups I have seen my fair share of culture related successes and failures. Brett’s planning & design of what Culture is required to ensure hiring of the best talent is the best way to win this battle. 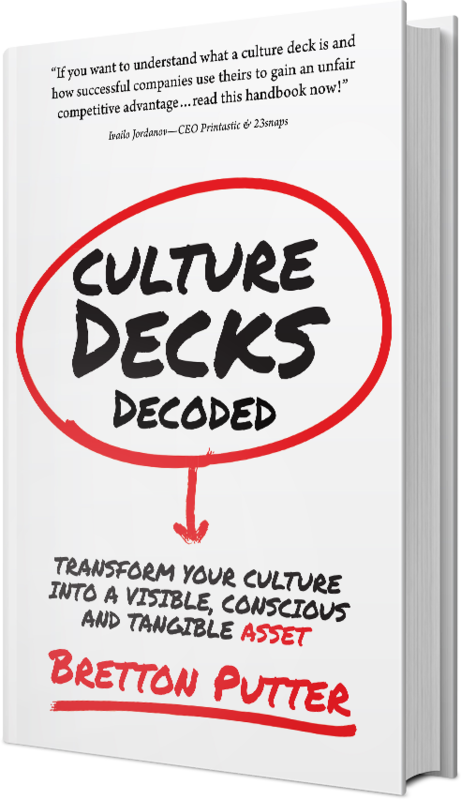 Reading Culture Decks Decoded is a great first step. 17 years of experience working with start-up and high growth companies has allowed Brett to build an elegant and simple framework for the creation of a culture deck.